We offer good quality Passiflora Incarnata Leaves, it is wildcfrated herb collected from forests in India. We are engaged in offering a quality approved range of Passiflora Incarnata Flower. We are collecting and drying Passiflora herb and some other Medicinal and Herbal plants and supplying with good quality and good colour. Also we are trading with many herbal and medicinal raw materials. Interested persons contact us. We are offering Passiflora Leaves to our client. Passiflora, the passion flowers or passion vines, is a genus of about 500 species of flowering plants, the namesakes of the family Passifloraceae. They are mostly vines, with some being shrubs, and a few species being herbaceous. Ananta Green Farm Pvt. Ltd.
We are offering our customers an excellent quality range of Passiflora Incarnata. 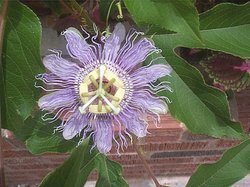 It is commonly known as maypop, purple passionflower, true passionflower, wild apricot, and wild passion vine, is a fast growing perennial vine with climbing or trailing stems. Used as a herbal medicine to treat nervous anxiety and insomnia. We, jk exports introduce ourselves as a rare herbs cultivator in india & doing extraction from rare medicinal herbs, cosmetic herbs & ayurvedic herbs.